Aug. 3, 2011, 10 a.m.
By Nikki Usher and Seth C. Lewis Aug. 3, 2011, 10 a.m. This spring, the Knight Foundation and Mozilla took the premise of hacks and hackers collaboration and pushed it a step further, creating a contest to encourage journalists, developers, programmers, and anyone else so inclined to put together ideas to innovate news. Informally called “MoJo,” the Knight-Mozilla News Technology Partnership has been run as a challenge, the ultimate prize being a one-year paid fellowship in one of five news organizations: Al Jazeera English, the BBC, the Guardian, Boston.com, and Zeit Online. We’ve been following the challenge from contest entries to its second phase, an online learning lab, where some 60 participants were selected on the basis of their proposal to take part in four weeks of intense lectures. At the end, they were required to pitch a software prototype designed to make news, well, better. We also heard from journalists: Discussing the opportunities and challenges for technology and journalism were, among other luminaries, Evan Hansen, editor-in-chief of Wired.com; Amanda Cox, graphics editor of The New York Times; Shazna Nessa, director of interactive at the AP; Mohamed Nanabhay, head of new media at Al Jazeera English; and Jeff Jarvis. In other words, over the four weeks of the learning lab’s lectures, we heard from a great group of some of the smartest journalists and programmers who are thinking about — and designing — the future of news. So, after all that, what can we begin to see about the common threads emerging between the open source movement and journalism? What can open source teach journalism? And journalism open source? * Open source is about transparency. * Journalism has traditionally not been about transparency, instead keeping projects under wraps — the art of making the sausage and then keeping it stored inside newsrooms. Because open-source software development often occurs among widely distributed and mostly volunteer participants who tinker with the code ad-hoc, transparency is a must. Discussion threads, version histories, bug-tracking tools, and task lists lay bare the process underlying the development — what’s been done, who’s done it, and what yet needs tweaking. There’s a basic assumption of openness and collaboration achieving a greater good. Ergo: In a participatory news world, can we journalists be challenged by the ethics of open source to make the sausage-making more visible, even collaborative? No one is advocating making investigative reporting an open book, but sharing how journalists work might be a start. As Hansen pointed out, journalists are already swimming in information overload from the data they gather in reporting; why not make some of that more accessible to others? And giving people greater space for commenting and offering correction when they think journalists have gone wrong — therein lies another opportunity for transparency. * Open source is iterative. * Journalism is iterative, but news organizations generally aren’t (yet). Software development moves quickly. Particularly in the open source realm, developers aren’t afraid to make mistakes and make those mistakes public as they work through the bugs in a perpetual beta mode rather than wait until ideas are perfected. The group dynamic means that participants feel free to share ideas and try new things, with a “freedom to fail” attitude that emphasizes freedom much more than failure. Failure, in fact, is embraced as a step forward, a bug identified, rather than backward. This cyclical process of iterative software development — continuous improvement based on rapid testing — stands in contrast to the waterfall method of slower, more centralized planning and deployment. On the one hand, journalism has iterative elements, like breaking news. As work, journalism is designed for agility. But journalism within legacy news organizations is often much harder to change, and tends to be more “waterfall” in orientation: The bureaucracy and business models and organizational structures can take a long time to adapt. Trying new things, being willing to fail (a lot) along the way, and being more iterative in general are something we can learn from open-source software. * Open source is about standards. We were surprised to find that, despite its emphasis on openness and collaboration, the wide world of open source is also a codified world with strict standards for implementation and use. Programming languages have documentation for how they are used, and there is generally consensus among developers about what looks good on the web and what makes for good code. Journalism is also about standards, though of a different kind: shared values about newsgathering, news judgment, and ethics. But even while journalism tends to get done within hierarchical organizations and open-source development doesn’t, journalism and open source share essentially the same ideals about making things that serve the public interest. In one case, it’s programming; in the other case, it’s telling stories. But there’s increasingly overlap between those two goals, and a common purpose that tends to rise above mere profit motive in favor of a broader sense of public good. However, when it comes to standards, a big difference between the the open-source movement and journalism is that journalists, across the board, aren’t generally cooperating to achieve common goals. While programmers might work together to make a programming language easier to use, news organizations tend to go at their own development in isolation from each other. For example, The Times went about building its pay meter fairly secretly: While in development, even those in the newsroom didn’t know the details about the meter’s structure. Adopting a more open-source attitude could teach journalists, within news organizations and across them, to think more collaboratively when it comes to solving common industry problems. * Open-source development is collaborative, free, and flexible. * Producing news costs money, and open source may not get to the heart of journalism’s business problems. Open-source software development is premised on the idea of coders working together, for free, without seeking to make a profit at the expense of someone else’s intellectual property. Bit by bit, this labor is rewarded by the creation of sophisticated programming languages, better-and-better software, and the like. Then again, the business model question isn’t, specifically, the point. The goal of MoJo’s learning lab, and the innovation challenge it’s part of, is simply to make the news better technologically — by making it more user-friendly, more participatory, etc. It’s not about helping news organizations succeed financially. In all, the MoJo project has been more about what open source can teach journalism, not vice versa. And that’s not surprising, given that the MoJo ethos has been about using open technologies to help reboot the news — rather than the reverse. But as the 60 learning lab participants hone their final projects this week, in hopes of being one of the 15 who will win a next-stage invite to a hackathon in Berlin, they have been encouraged to collaborate with each other to fill out their skill set — by, say, a hack partnering with a hacker, and so forth. From those collaborations may come ideas not only for reinventing online journalism, but also for contributing to the iteration of open-source work as a whole. So keep an eye out: Those final projects are due on Friday. POSTED Aug. 3, 2011, 10 a.m.
Seth C. Lewis, Nikki Usher and. "Transparency, iteration, standards: Knight-Mozilla’s learning lab offers journalism lessons of open source." Nieman Journalism Lab. Nieman Foundation for Journalism at Harvard, 3 Aug. 2011. Web. 25 Apr. 2019. Seth C. Lewis, Nikki Usher and. "Transparency, iteration, standards: Knight-Mozilla’s learning lab offers journalism lessons of open source." Nieman Journalism Lab. Last modified August 3, 2011. 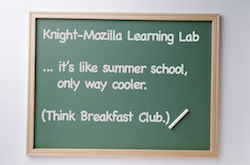 Accessed April 25, 2019. https://www.niemanlab.org/2011/08/transparency-iteration-standards-knight-mozillas-learning-lab-shares-lessons-of-open-source-for-journalism/.